This is a record of my learning during my time at Pt England School. I now attend St Peters College, Auckland. The main charactars are clouds and storks. Where this story begins is in a place where you'd never imagine up high in the sky where the clouds are. The story starts by showing the storks delivering puppies, babies and kittens. Then it shows a grey cloud there are other clouds that are more whiter. The grey cloud can't seem to create nice things like the other clouds. 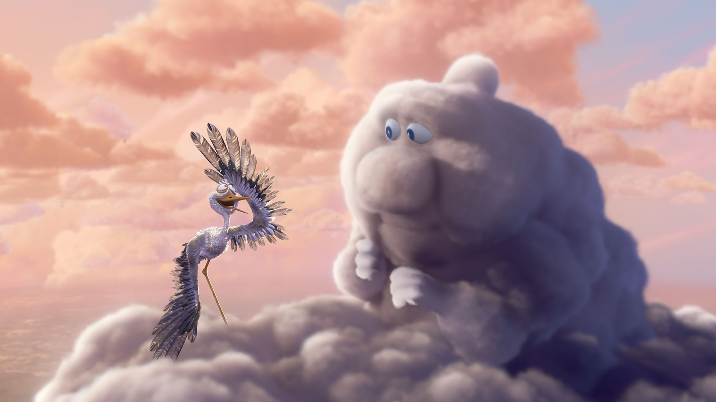 The stork that the grey cloud has is sort of scared of the things that the grey cloud makes. In the end the grey cloud gets left behind by his stork then the grey cloud makes up a storm. He see's his stork with the other clouds and begins to cry then his stork comes back but this time he has something to protect himself. I'd give this anamation a 7 it is funny in some ways but sometimes sad. Labels: Darius, pt england, ptengland school. Some of your sentences have more than one idea, so I'm getting a little confused. Do you think you could read your text through carefully, and make it a bit clearer for me. Hi my name is Darius. I'm now year 9 and attend St Peters College, Auckland. For the last 8 years I was at Pt England School where my blog first started in 2010. I enjoy playing sports and trying to keep fit. I like listening to music and playing games on my phone. Please leave me a comment when you view a post. This is my animation about Europeans coming to New Zealand during the 1800s. I created this using Hyperstudio.